Today, it is exactly ninety years ago that E.M. Forster published his final novel, A Passage to India, on 4 June 1924. In honour of the occasion, Interesting Literature presents five fascinating facts about the author and the book that would ensure Forster’s eminence for the next century. 1. Forster famously visited the hill caves of Barabar in the North Indian state of Bihar on the morning of 28 January 1913, and used his experience to give form to one of the pivotal moments in A Passage to India when Adela Quested and Mrs Moore visit the caves of Marabar. As Adela and Mrs Moore do in the novel, Forster went part of the way by elephant, then climbed the hills on foot. When they tried to get the cave to echo their voices, as Forster wrote to his mother, ‘whatever was said and in whatever voice the cave only returned a dignified roar’. 2. Forster felt daunted by India when he first visited it in 1912-1913. The author found that both its landscape and its people defied description and understanding. Reminiscing about his visit to the ancient Indian city of Ujjain, he writes: ‘One confusion enveloped Ujjain and all things. Why differentiate? I asked the driver what kind of trees those were, and he answered ‘Trees’; what was the name of that bird, and he said ‘Bird’; and the plain, interminable, murmured ‘Old buildings are buildings, ruins are ruins’. 3. In 1960 Forster appeared as a witness for the defence in the trial for D.H. Lawrence’s suppressed novel, Lady Chatterley’s Lover. Many writers did so, and Lady Chatterley was cleared of the obscenity charges and published. 4. During the First World War, Forster worked as a medical orderly in Alexandria in Egypt. He refused to fight as a soldier because of his pacifist ideals. 5. In A Passage to India Forster did not only relate the tales of Mr Fielding, Adela and Dr Aziz; he also tried to portray what he saw as the spiritual impasse science, history and art had failed to overcome. Parts of that vision rings true today. Speaking about his visit to an exhibition of Indian photographs in London, Forster said that ‘you cannot imagine how much we over here are in need of inspiration, of spirituality, of something which will deliver us from the tyranny of the body-politic. Besides our war against totalitarianism, we have also an inner war, a struggle for true values, a struggle of the individual towards the dark secret place where he may find reality’. 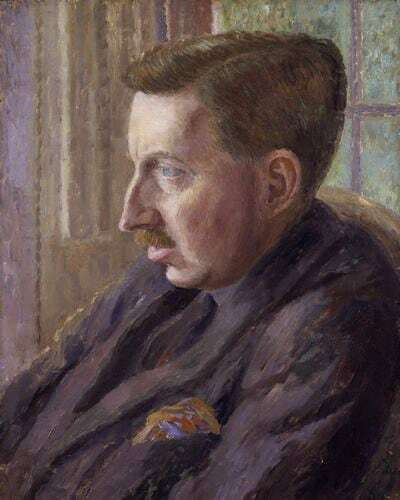 Image: E. M. Forster by Dora Carrington, 1924/5, public domain. Forster’s “Maurice” was one of the most tender yet daring romances I have ever read. I quite agree. I still tear up rereading the final passage of the book, describing Clive’s memory of Maurice from their university days. I saw the movie and found the starkness of the situation as disturbing. Worlds collide and do not mesh well. True as life itself. Room with a View must be one of my favourite books, and films (The Helena version!) of all time. Great facts about a book I love and a country I adore. Interesting, thank you. Having read and enjoyed A Passage to india a couple of years ago it’s good to get some background. Brilliant post, and here I thought I knew everything there was to know about E.M Forster. I recommend his unfinished novel Arctic Summer to any that haven’t already heard of it. I personally believe it could have been of the same literary standard as A Passage to India if he had finished it.